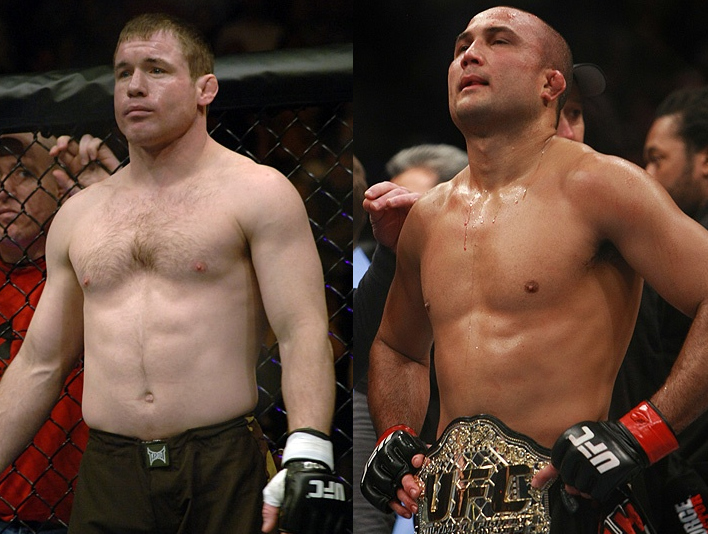 For the third time, Matt Hughes and BJ Penn will fight against each other inside the Octagon. Who will be knocked out this time around? And who will pave the way for UFC 123 in Detroit? For the third time, former UFC champs Matt Hughes and BJ Penn will meet at welterweight in UFC 123, that will take place at The Palace in Detroit. Hughes and Penn first fought at UFC 46 in January of 2004, wherein Penn submitted Hughes with a rear naked choke. But prior to that match, Hughes had defended the welterweight belt for five straight times. They met again at UFC 63, at which point Hughes — champion again that time — won with a third round TKO to contend his title. Inducted as a UFC Hall of Fame in May, Matt Hughes has won three straight fights, including the Submission of the Night win over Ricard Almeida at UFC 117. Boasting a record of 18 victories, he beats off the belt for a total of seven times over his two welterweight title reigns. After his submission victory over Almeida, he intended to take the fall and winter off to spend time at his farm in Hillsboro. But a trilogy fight against Penn is alluring enough to change those plans. Considered by the many as the dominant lightweight, BJ Penn has lost two consecutive fights against Frankie Edgar. Penn’s title was snatched away by Edgar at UFC 112 last April via unanimous decision, and was dominated in the UFC 118 rematch. Prior to his loss to Edgar, Penn has won the lightweight title at UFC 80, and defended it thrice. After beating Hughes at UFC 46 for a welterweight title, he vacated the belt for almost two years. The UFC 123 will be gracing the promotion’s first trip to Michigan since UFC 9 in 1996. Though not officially announced, the main event is anticipated to be a light heavyweight match between Lyoto Machida and Quinton “Rampage” Jackson.